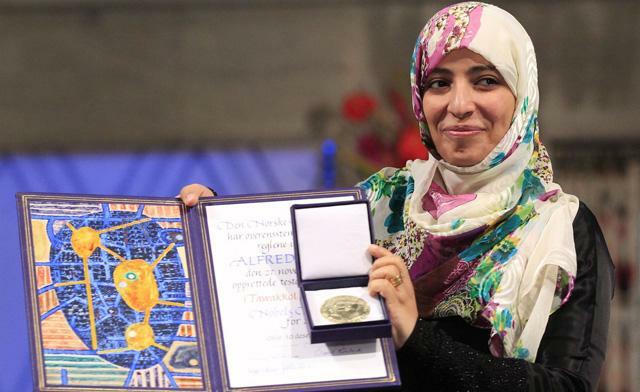 With Tawakkul Karman, the Norwegian Nobel Price committee has revised its wrong decision of 2009. At least, she deserves. What a great choice. What a beautiful woman. Anyway, it’s Norwegian hubris at its best. The real candidates this year, besides Tawakkul, were Julian Assange and Bradley Manning. Disempower Jagland and his ridiculous committee. Update December 14, 2011. See her speech during the ceremony, provided by Democracy Now! here. This entry was posted in Uncategorized and tagged Arab uprising, Nobel Peace Price 2011, Tawakkul Karman, Thorbjorn Jagland, Yemen. Bookmark the permalink.